This vegan summer stone fruit chia pudding parfait is subtly sweet, incredibly creamy, and totally breakfast appropriate (yet just as dessert-worthy). 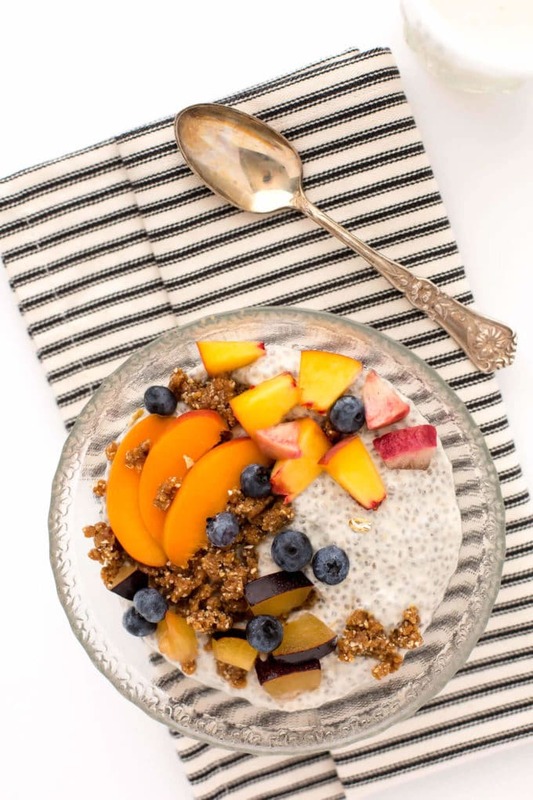 It’s packed to the brim with detoxifying chia seeds, fiber-rich oats, and vitamin-laden fruit. 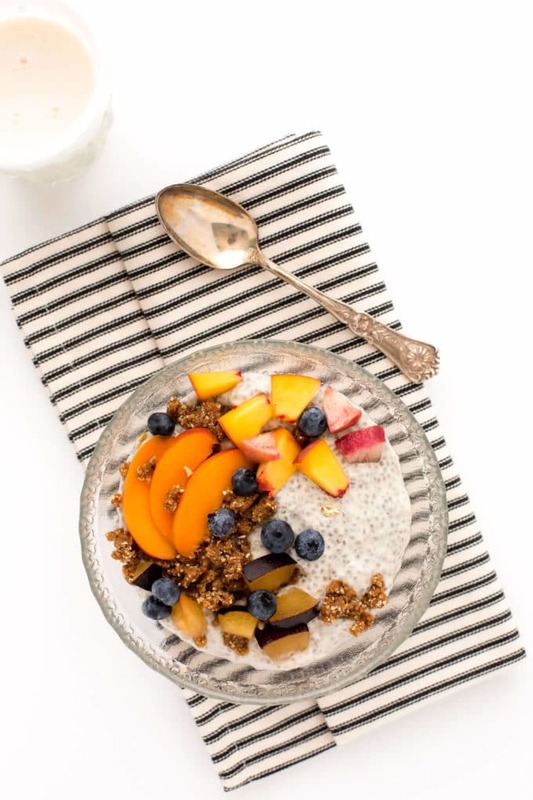 Creamy vanilla chia pudding is topped with raw granola clusters and piled high with sweet summer stone fruit. Does it get any better? 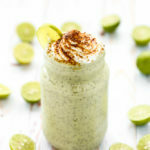 Ever since I shared this recipe for coconut yogurt chia seed pudding parfaits last summer, I’ve been ranting and raving about how life-changing it is to use homemade yogurt in chia seed pudding. 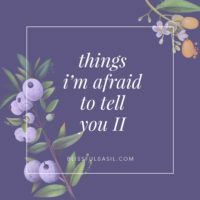 I’ve gone on and on about it to the point where you probably just want me to zip it about the homemade yogurt, because who in their right mind makes homemade yogurt on the regular? Well, turns out I was just crazy enough to make homemade yogurt on the regular. That is, up until a few months ago when a string of rotten young Thai coconuts quite literally left a bad taste in my mouth. For the record, if you ever crack open a coconut and find purple/pink slimy flesh (as opposed to bright white firm flesh), toss that coconut like it’s hot. And by “hot,” I mean rotten. I naively attempted to make coconut yogurt with the stuff and it wasn’t pretty. So, after wasting far too many precious dollars attempting to make homemade yogurt from rotten coconuts, I set out to find a reliably tasty, ultra-trusty store-bought plant-based alternative. Most were too creepily smooth and jiggly/gelatinous. Some were too sweet. Many lacked protein altogether. And others simply had too many unpronounceable ingredients to feel good about eating on the regular. It wasn’t until just a few weeks ago that I finally found a plant-based yogurt with the taste, texture, and nutritional prowess of the “real” stuff (including 6g of plant-powered protein per serving). And guess what? It makes a darn good chia pudding, too. Silk Almondmilk Yogurt Alternative comes in four flavors: Plain, Vanilla, Strawberry, and Peach. I have yet to try the Strawberry or Peach but am loving the Vanilla on its own and the Plain for recipes. As you might have noticed, I’m a picky B when it comes to plant-based yogurt, and I’ve found that so many (read: most) boast a taste and texture that’s forced or manufactured. Ick. This one is a refreshing and real departure from the rest. 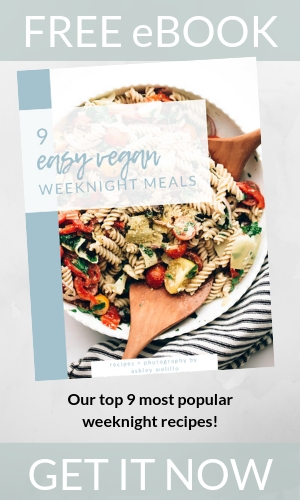 Plus, it’s made with just two main ingredients: almond milk + a small amount of cane sugar (plus live + active cultures, vitamin D2, calcium citrate, and pectin). That’s it. I’m not much of a nutrition-fact checker but I’m certainly an ingredient checker, and that’s a slim + familiar lineup compared to all the rest. Best part? This is the only store-bought yogurt I’ve found that creates a chia pudding that is just as rich, creamy, and smooth (as opposed to goopy) as when using homemade yogurt. Triple threat? I think so. 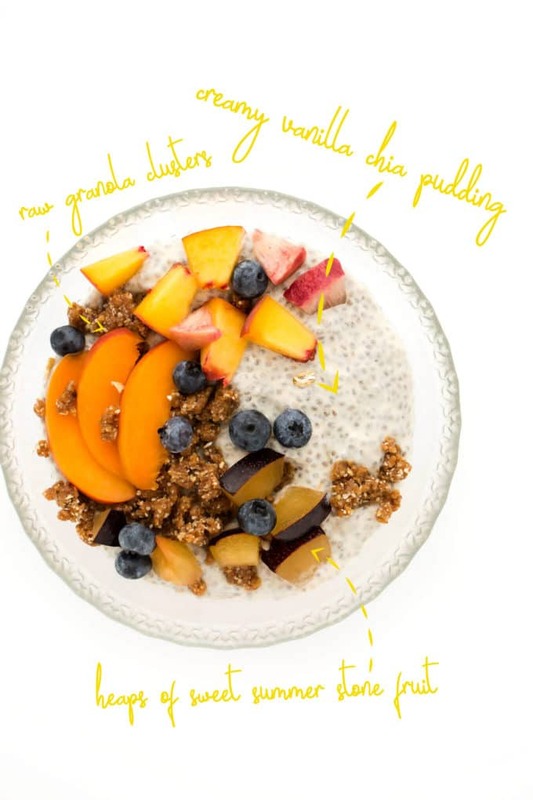 To make this sweet summer parfait, you’ll start by rounding up your chia pudding ingredients. Add the yogurt, almond milk, maple syrup, vanilla, and sea salt to a medium mixing bowl and whisk together until smooth. Then, add the chia seeds and whisk to incorporate. Chill the chia pudding overnight (or for at least 6 hours). As always, the wait for chia pudding can be painful, but I promise your patience will be rewarded with deliciousness come daybreak. Next, you’ll prepare the granola clusters. You can either whip these together in the morning before serving or prepare them ahead of time and refrigerate until ready to assemble. To make them, add raw almonds, oats, Medjool dates, cinnamon, vanilla, and sea salt to a food processor. Pulse a few times and then process for about two minutes, or until the mixture begins to clump together into crumbles. Just before assembling your parfaits, dice up some sweet summer fruit. 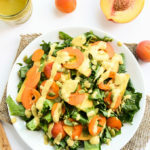 I recommend using an array of stone fruit (think peaches, apricots, nectarines, and plums), but feel free to mix and match to your heart’s content. In addition to the stone fruit, I love to add a small handful of blueberries for a pop of color. Once each parfait component is prepped and ready, it’s time to assemble. 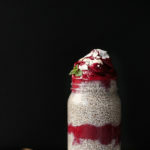 Spoon the chia pudding into small bowls or parfait glasses and layer or top with the granola crumbles and fruit. 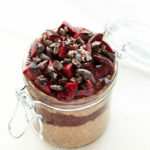 Then, grab your favorite spoon and dig right on in to this tasty summer stone fruit chia pudding parfait. This vegan summer stone fruit chia pudding parfait is subtly sweet, incredibly creamy, and totally breakfast appropriate (yet just as dessert-worthy). Plus, it's packed to the brim with detoxifying chia seeds. 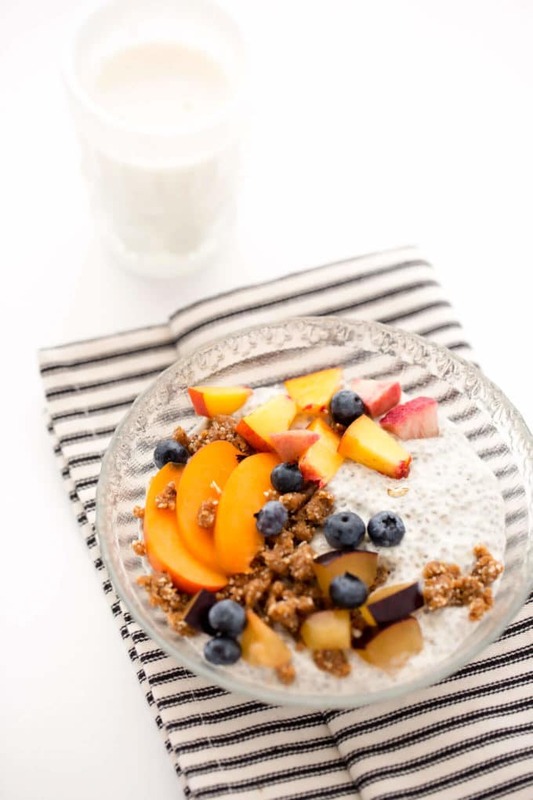 Creamy vanilla chia pudding is topped with raw granola clusters and piled high with sweet summer stone fruit. Does it get any better? In a medium-sized airtight container, whisk together the yogurt, milk, maple syrup, vanilla, and sea salt. Add the chia seeds and whisk until they're evenly dispersed throughout the liquid. Refrigerate for at least 6 hours or overnight to thicken. Thoroughly whisk after refrigerating to redistribute the chia seeds. 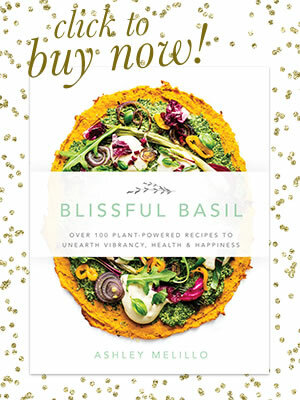 If the mixture is too thick, whisk in more plant-based milk, 1 tablespoon at a time to thin; if it's too thin, whisk in more chia seeds, 1 tablespoon at a time, to thicken. Add the almonds, oats, dates, cinnamon, vanilla, and sea salt to a food processor. Pulse 10 times and then process for 1 to 2 minutes, or until it begins to clump together in a crumbly, slightly-sticky mixture forms. 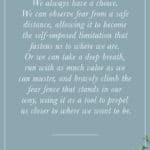 At first it will seem like it doesn't have enough moisture to clump together, but just keep processing. 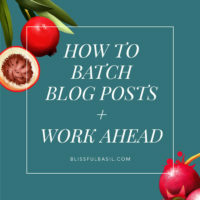 The longr you process, the warmer and stickier the dates will become. Cover and refrigerate until ready to use. 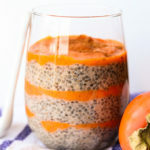 Layer the chia pudding and granola crumbles into 4 bowls or parfait glasses. Top with the diced stone fruit, and serve immediately. 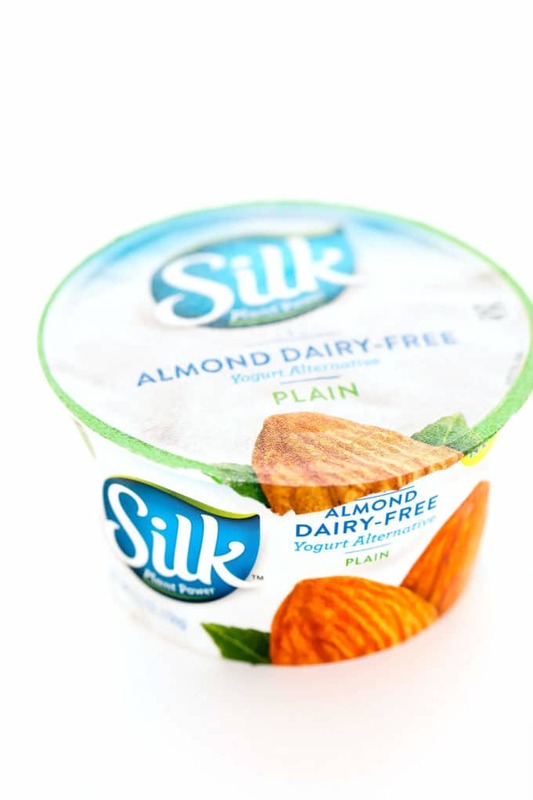 *Use this store locator to find Silk Almond Dairy-Free Yogurt Alternative, and visit this page for a coupon! This looks refreshing. 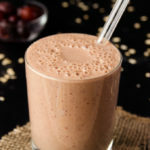 I’ve been making a lot of smoothies and juices for breakfast and have been missing some texture. This looks like the perfect recipe to start with. 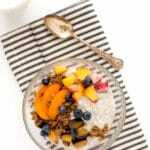 Healthy and delicious vegan recipe Ashley, looks like the perfect breakfast snack!